A souped up S-class. Sometimes you wonder why such monsters are even made, as the typical owner of a Mercedes Benz S-class would be chauferred around in the back seat instead of driving the car. There’s just not much point to it. But that’s not stopping it to be done. Yup, they do it just because they can, and because people will pay for it. 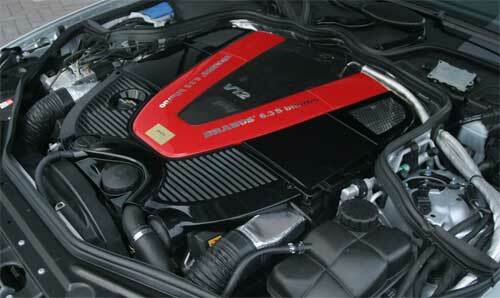 This is the Brabus S V12 S Biturbo, derived from the new 2006 Mercedes Benz S600. From the side profile, you can immediately notice the huge 21 inch Brabus Monoblock light weight wheels. These are not just for aesthetics, but are necessary to install the improved braking system. The car stops with the help of 12-piston calipers on 380 x 36mm discs at the front wheels, and 6-piston calipers on 355x28mm discs at the rear wheels. As for the bodykit, they do not just enhance the aesthetics of the car but they improve aerodynamics as well. The front apron and the side skirts have been developed in a wind tunnel. They help reduce lift on the front axle at high speeds. The bumper design’s gaping central air inlet also allows better cooling for the engine. As for the engine, both forced induction and no replacement for displacement concepts were incorporated into getting more power out of it. Better pistons, longer stroke and increased bore increases displacement from 5.5 litres up to 6.3 litres. The engine also receives bigger turbochargers, a more efficient intercooling system and the usual intake and exhaust upgrades. A huge displacement engine, turbocharged, results in peak torque of 1320Nm from as low as 2100rpm. That’s crazy. However somehow Brabus has decided to limit the torque output electronically to 1100Nm. Maximum horsepower is 730hp at 5100rpm. The car is pushed by the back wheels, through a 5-speed automatic transmission, also tweaked by Brabus. There is an optional Brabus LSD kit for the car too. The car goes from 0-100km/h in 4 seconds, and 0-200km/h in 11.9 seconds. Top speed is electronically limited to 340km/h.